I carefully walked in my waders along the shores of a small northeastern Illinois tributary stream. I was casting my Shallow Manta through the pool to any current seams and deep holes I saw. 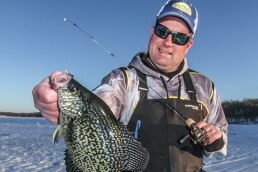 The cool November climate and 40-degree waters called for a slow retrieve with longer pauses through the deepest holes. The water wasn’t pristine or picturesque, but terribly urban with riprap concrete and drainage pipes. Despite the artificial habitat with small remnants of a polluted history, I did encounter a scrappy 30-inch muskie that came charging out from its staging hole. Several years ago, this stream might have been lifeless thanks to man’s neglect, urban abuse, stream degradation and pollution. Today, the stream, along with many others in northeastern Illinois, has been cleaned up and supports aquatic life. Through stocking efforts and extensive migrations from our region’s network of inter-connected streams, muskies have made their way into my local river and others. This species has defied the odds of fisheries managers and anglers alike, able to survive impaired water quality and degraded habitats. With this species taking up residence in many deeper holes of streams, it’s hard for many to believe they thrive in such underrated fisheries within a major metropolitan area. Muskie fishing used to be a sport that required extensive and expensive travels for a quality experience. Not anymore. 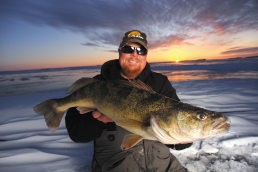 Today, some of the success stories in muskie fishing involve newly created urban opportunities and fisheries. These fish do live in small rivers and streams. Most are native fisheries or are rehabilitated while others are stocked and artificial like the suburban Chicago streams that I fish. 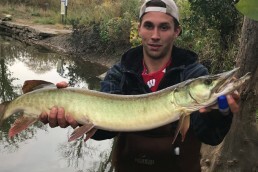 Across this fish’s range, several underutilized streams and rivers contain healthy, moderate, fishable populations of muskies. These include some larger ones if they’re unexploited and are given the chance to grow. 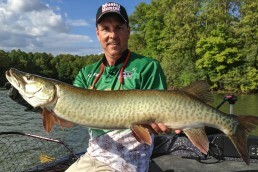 Smaller waters receive the less pressure and angler exploitation, so they’re the easiest in which to encounter muskies throughout their range. Seasonal muskie locations in rivers and streams can change drastically due to seasonal reasons, but they can also occur across much shorter time spans such as periods of flood or biological or other natural causes. 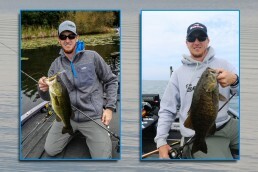 When targeting muskies, I’ll fish locations based on season and water temperature. Summertime stream locations are based on ideal, comfortable water temperatures (60-75 degrees) and on forage migrations. If you’re seeing lots of suckers and shad present in the vicinity of your wading and shore fishing, muskies won’t be far away. Where this fish ends up after the post- spawn migration depends on river conditions and forage location. 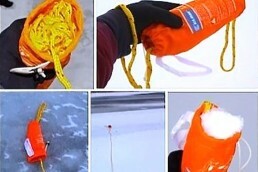 This can vary greatly from one season to the next. The major factors are water levels, current, water clarity, forage location, water temperature and oxygen levels. During normal summer conditions, muskies will roam freely throughout a stream in pursuit of forage. 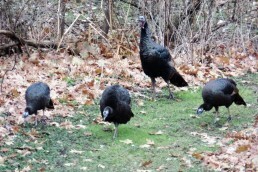 Otherwise, they will set up in preferable structure and ambush areas near or amidst the forage. Often, forage-fish species will make their own summer migrations in search of food and homing, and the muskies will follow. They will often hold in deeper tailwaters and pools, near bridges and their abutments or man-made riprap or rock walls. They’ll also ambush from natural cover such as logjams and laydowns, weeds and vegetation, and also sit in deep pools and holes patiently waiting for unsuspecting baitfish to pass by. 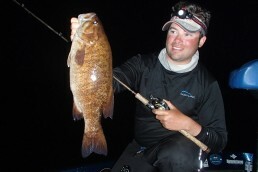 And the fast-moving, aggressive presentations, such as bucktails and topwaters, enable me to quickly cover water. Extreme August heat presents a real problem to fisheries, and will cause muskies to undergo drastic behavioral changes, and some heat waves can lead to annual summertime fish kills. If conditions become unfavorable in one part of a river, the muskies will move to an area more suited to their needs. If the conditions they’re escaping are physically stressful and harmful, the need for survival will supersede everything else. During a typical August heat wave, many northern Illinois rivers can boil at 90 degrees. Survival becomes urgent as muskies begin to undergo harmful bodily stress. Hot water is detrimental to muskies because it is poorly oxygenated. The warmer the water gets, the less dissolved oxygen it possesses. As water warms, muskies require more oxygen in order to survive. Warm waters are proven to be lethal to this species due to suffocation and lactic acid buildup. Imminent death to these fish can occur if they’re caught. When water temperatures are over 80, muskellunge seek cooler water. However, locating these cool-water areas in smaller rivers—especially in urbanized areas—can be near impossible. Here, muskies settle into the fastest, shallowest water with current they can possibly find. They will lay belly-to-the-bottom with their faces into the current, motionless. With this dormant activity, they can maintain adequate oxygen levels and survive extremely hot summers. 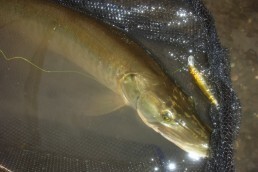 Once the water temperatures cool and the muskies recover, they will move back into their preferred summertime locations. In midsummer heat waves, I take a break from the muskies and focus on warm-tolerant species instead. I encourage all others to do the same. Sometimes I’ll cease muskie fishing altogether, only to resume again in early fall when I know these fish will fully survive after being caught and released. 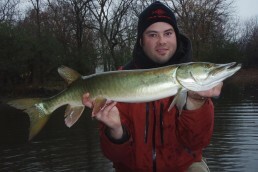 During fall, muskies move into deeper and slower water as forage migrations are triggered. Muskies will follow the forage, especially if the migrating species is a main food source. 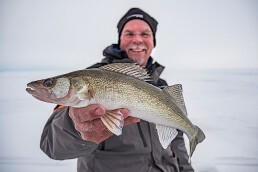 In Illinois, these are often shad, creek chubs, golden shiners, white suckers, silver redhorse, quillback and carp suckers. Sometimes these will migrate downstream into the larger streams and rivers the smaller tributaries flow into. The muskies may migrate heavily into the larger rivers. As the waters cool the muskies will move out of shallow, fast water toward deeper slower holes. Early fall sees water temperatures drop into the low 60s, and occurs as early as mid-September or even as late as mid-October. 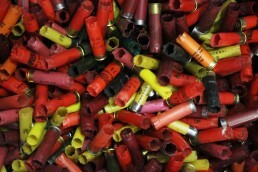 Most deep holes I target are small and only 4 feet and deeper. 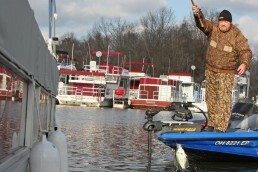 The muskies’ willingness to chase and attack fast lures decreases so slower presentations are favorable. The Shallow Manta on the small streams has great hang time in the strike zone, giving muskies a chance to see and hopefully strike it. 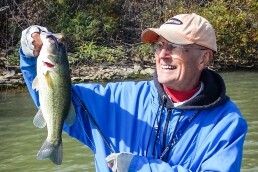 The glide is side to side, and this lure slips perpendicular to the current. This enables me to work parallel to the bank when I’m forced to cast perpendicular to overhanging tree branches. The rivers and streams can be legally accessed at marked locations, roadsides and bridges. Forest preserves and parks are also excellent public-access points and provide scenic fishing if they’re not pressured or abused locations. Most river shorelines are also publicly accessible up to the high water mark. 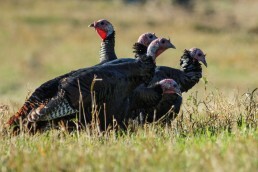 Make sure your access is legal and that you’re not trespassing on private lands. 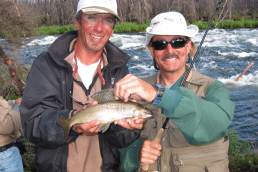 If wading, consider all safety precautions, as both current and the depths can be deceptive and dangerous. 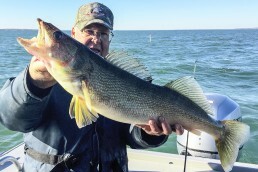 Due to rugged terrain and their unknown underwater topography, many northeastern Illinois rivers are not the safest environments for casual wading. All types of river habitat, no matter how urban and ugly it looks, have the potential to hold fish. In order to catch a stream’s resident muskies, I’ll walk as much water as I can to encounter the most fish. If a shoreline isn’t too steep or wooded I’ll fish from shore to avoid spooking fish, and I wear waders. If I must be in a river I’ll stay as far as I can from any structure targeted. Walking upstream is best to avoid washing mud and debris into the water that hasn’t been fished yet. Fish the smaller rivers with only a few pieces of tackle. 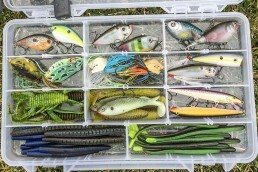 Usually a small backpack with a dozen or so lures stored in a clear box is plenty. 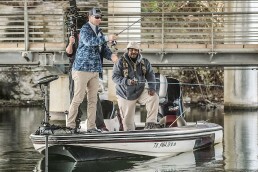 Proper rod and muskie weight tackle is suggested, but if you are on a budget a medium-heavy-weight spinning or casting rod with downsized lures work, at times. 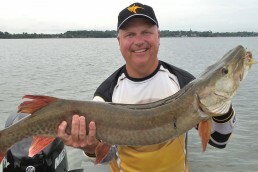 Often, standard muskie lures are necessary and the most effective to entice numbers and the largest. Spool your reel with a minimum of 50-pound-test braid with a 100-pound-test minimum fluorocarbon or steel leader and you are set. Another valuable river tool is the USGS website (waterdata.usgs.gov/nwis/rt) and their mobile phone app. This provides me with real-time stream-flow data so I can determine if my specific river or stream is fishable or not. Muskies thrive in many river and stream environments. Good water quality is preferred, but many are quickly discovering that this species will live and grow well in less-than-ideal water quality and habitat. 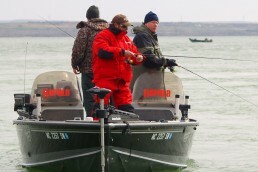 Illinois fisheries biologists have taken note of this and may consider stocking fish into other regional water bodies to create new angling opportunities. With natural reproduction almost nonexistent for muskies in Illinois due to high siltation and poor habitats, stocking assistance is required to maintain these populations to fishable levels. All muskie streams are exceptionally fragile fisheries and must be treated by pursuing anglers with care and only with catch-and-release intentions. 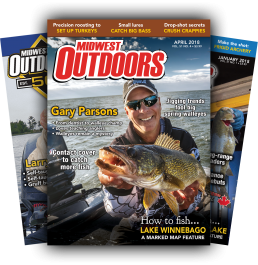 Midwest muskie fishing has expanded, and in recent decades this fish’s range has spread due to stocking and establishing new fisheries, rehabilitating former native fisheries or creating new opportunities for anglers. No matter how urban the river appears, don’t discredit it or judge it by its looks. There’s something to be said about catching muskies from small rivers, but thanks to new fisheries created throughout the area and region, few can argue that we don’t have quality muskie fishing now. 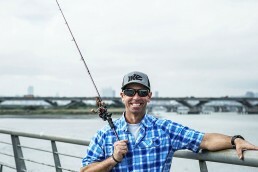 It’s rewarding catching these locally, especially from underrated urban fisheries.